Erik Tosten is a graduate of the University of Iowa and The University of North Texas with two degrees in visual arts, and now teaches as a professor of digital design at the University of Texas at Arlington. He has lived, worked, and exhibited as an artist in Dallas since 2000 and is now focusing on woodworking with the goal of creating housewares that look good and last generations. Propelled by an urge to return commerce back to a localized economy, he sees woodworking as a rebellion against the mass-produced disposable object makers of the world. 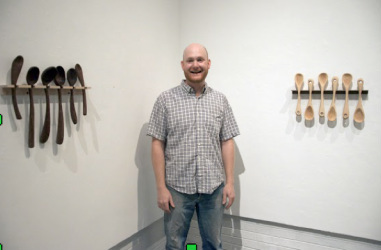 Erik likes making spoons, because of the inherent value in functional forms, and believes that there is comfort found in using one-of-a-kind handmade objects that you don’t get from mass-produced objects. Each spoon starts from a sketch that is drawn directly on wood which is then cut out by hand giving each piece its own personality. In the wood shop, Erik chooses to use traditional hand tools, because of their ability to respond to the unique characteristics of the wood grain. Erik likes to think that his spoons show the individuality of both the user and maker, because handmade objects are stronger, funkier, get better with age, and never go out of style. His goal in the wood shop is to slow down and take the time necessary to make objects that are perfect in form and function. Feel free to email him with any questions or for a chance to check out the wood shop.